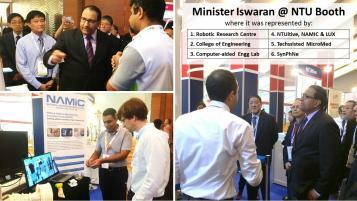 Thank you for visiting our counter at the NTU’s Booth. We hope you had an incredible time at ICRA2017. ICRA2017 is an IEEE International Conference on Robotics and Automation that brings together global public and private sector leaders in robotics and automation, to discuss the latest research, technological and policy trends in this exciting field. Trade and Industry Minister (Industry) Mr S Iswaran, mentioned at the opening ceremony that robotics and automation are key areas of focus, both as a potential new growth area, and as enablers to help our enterprises adopt advanced manufacturing processes to increase productivity. He said: ”Singapore is well-placed to continue driving growth in the adoption and development of robotics and automation solutions. We have a strong base of robotics and automation R&D performers and system integrators. A*STAR’s Industrial Robotics Programme, for instance, has brought together the robotics research community from NUS, NTU, SUTD and A*STAR Research Institutes to advance robotics solutions for industry partners, including Sembcorp Marine and Spiral Marine.” NAMIC CLP, with the support from the hubs of NAMIC@NTU, NAMIC@NUS and NAMIC SUTD, took part in the exhibition from 30 May to 1 June 2017 at Marina Bay Sands Expo and Convention Centre.